Growing up, “The Tale of the Dark Dragon” was one of my absolute favourite Are You Afraid of the Dark? episodes. My older sister and I were obsessed with the movie Teen Witch. And there was something so glamorous about magic that could transform you. 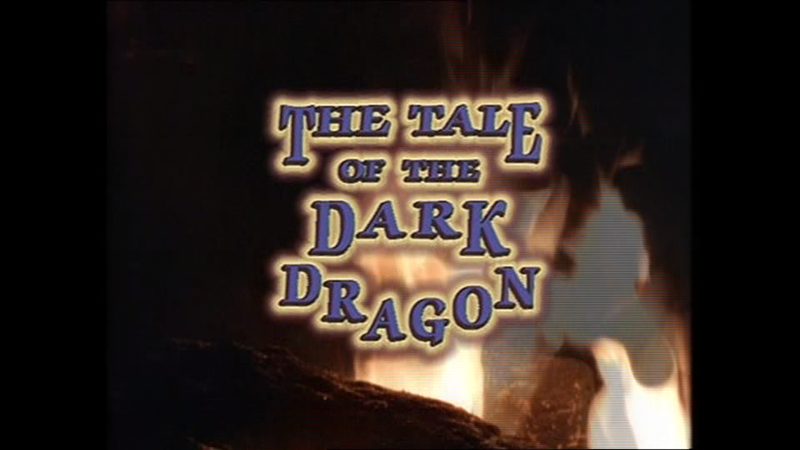 The magic in “The Tale of the Dark Dragon” is much darker and twisted than Teen Witch (there’s also a lot less rapping). It’s Gary’s birthday so the Midnight Society surprise him with balloons. David tells him that he has a special magic story for Gary, borrowing one of Gary’s own characters. Keith is a young high school boy suffering from low self-esteem after suffering injuries in a car crash. He walks with a limp and needs a brace for his leg. The accident has left him with a personality that makes him virtually invisible. The school dance is approaching, and poor Keith is trying to attract the attention of Shelly, a girl whose boyfriend’s name is Gary (why David decided to name the worst character in the story after Gary is beyond me. Happy birthday?). When he notices Shelly and Gary are not speaking to each other, he gets the courage to ask her to the dance. But Shelly politely turns him down. Later, Keith is going through the newspaper where he sees an ad for Sardo’s Magic Mansion. The ad claims to be selling a potion that is able to “bring out the best” in whoever takes it. Keith goes to meet Sardo, who is a bit clueless as to which potion Keith is talking about. But he eventually finds it, and sells it to the boy. Sardo tells Keith that he can only have a drop of the potion at a time. While he at least knows it’s powerful, he doesn’t exactly know what the potion does. Keith puts a drop into a rabbit’s cage to test the potion, and sees that it works instantly. Keith walks out the shop with his potion, but doesn’t see that the rabbit turns into a literal fanged monster. Keith takes his first drop of potion (which seems to be pretty damn painful), and in the morning wakes to find that he’s exactly the same feeling suave, doesn’t need his brace anymore, and has the ability to wear leather jackets and style his hair. With his newfound confidence, Keith goes to the local diner and chats up Shelly. Only he introduces himself as KC, Keith’s cousin. Thankfully this episode avoids that “two-places-in-once” slapstick stuff. Alas, it’s hilarious how much this boosts Keith’s confidence. For some reason I didn’t remember this part of the episode, and I started choking on my lunch. As all cautionary tales go, things begin going awry. Each morning after Keith takes the potion, he returns to normal. He begins to do struggle in school and finds that he’s getting strange lesions on his skin. It’s clear that it’s all related to the potion, but it doesn’t stop him from constantly taking it. He asks Shelly to the dance again (as KC), and she accepts as he stupid boyfriend Gary hasn’t bothered to ask her. That next morning, Keith wakes up with a furry face and fangs. Keith goes to Sardo’s shop for help, and the two look at the potions book together. They discover that there’s a second page to the potion that says “before bringing out the best, one must fight the dark dragon within”. Neither knows what the hell the dark dragon is. Meanwhile, Keith’s friend Mariah has been watching him. She’s clearly into the boy: leg brace or no. She sees Keith running from his house to Sardo’s, so she tries to confront him when he gets home. He won’t open the door for her, scorning her for yet another time. But Keith doesn’t have time for fangs! He has a dance to attend! Keith goes to the school and takes his drop of potion, turning him into KC again. He enters the dance and sees Shelly, who doesn’t look too happy that Gary is dancing with another girl. Gary wins a trophy for best athlete, and dedicates his trophy to Shelly – the number one girl in his life. He asks her to dance, and Shelly happily agrees. Not even a potion can win poor Keith what he wants. Then a girl enters the room, and it’s clearly Mariah but she’s taken off her glasses (the 90’s, man). She explains that she loves him, and now that she’s a pretty girl, he can love her too. It’s so painful, but AYAOTD just managed to sum up being a sad, desperate teenager in one go. Keith looks pretty happy to be dancing with her, but she begins to double up in pain. She explains that she went into his locker and drank the entire bottle of the potion. She begins to quickly turn into a monster, and Keith believes she’s dying. Begins to cry and his tears and remorse land on Mariah’s shoulder. Suddenly, Mariah and Keith both find themselves completely okay. Keith, having realised that there are people who loved him for who he was, managed to beat the dark dragon that was within him since the car accident. Mariah clearly remembers nothing about what happens, but the two go off together back to the dance. Why does this episode get to me so much? Probably because I love 80’s movies and this was exactly like a horror-tv-show version of a John Hughes film. With bonus magic! Why the hell didn’t John Hughes ever put magic into his movies? Science? Fine. But we need potions, people! It is a bit cheesy, but I love the message of self-acceptance. And even characters like Shelly and Gary were more complex than just the typical “good looking and mean” side characters. Go and watch this damn episode now, people. Watch it now!